Yesterday was my first day of two week’s working with MB7‘s Iain Withers. Iain (and Cycling Scotland) have put together a a fat tire roadshow, featuring a squad of six gifted riders (two are pro trials & bmx riders, a couple are more focused on university studies. One of them, Danny McAskill, has not become famous yet, but will within a couple of years ). What is in Scottish water? I allot an hour to make the three-mile trip from Grove St. to Trinity Primary School partway down to Leith. ..Mustn’t be late the first day at work! 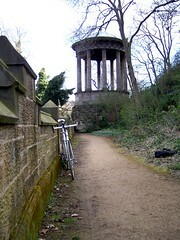 Armed with my trusty Spokes map (by now, it’s pretty soft and hole-y from wrongfolding and impatient shoving and unfurling x a hundred) in the overstuffed messynger bag, I ride wrong way down Torpichen Street in the general direction of the Water of Leith path. It’s the lyrical waterway that links Edinburgh’s trafficky art/tourist/business/residential world. It is not easy to locate. Every local knows it’s there, but most seem to have no clue precisely where it is from where they are standing. I know it’s right below me somewhere…I’d discovered it near the Drumsheugh Baths two weeks ago…but couldn’t locate it NOW. Fifty five minutes left on the clock. Took them, and was in an enclosed brick courtyard. Come back out, locate a mailman. Rudely turn away to seek better advice. I knew I would have to crawl out at Stockbridge, but somehow I surface too soon. Never rude to people who are patient (especially policepeople who might be in the middle of a Situation), I thanked him and made a mental note to write a note to the Edinburgh Council that their constabulary need rigorous training to memorize all the little cubbyholes of the Water of Leith path. it is a daydreamer’s delight. When you are doing ‘guided imagery’ (something cancer people are taught to get out of grumpy mind-set) this scene is precisely what I had pictured all those times in the therapist’s chair in the year 2000. I pass a lovely water temple with a stone statue. Hebe? Hygiea? Nah…she ‘s got a robe on. Anyway, I only have 30 minutes left to cover two and a half miles that I don’t know at ALL…The prior bit I thought I’d known quite well….wrong ). Rolling past dog-walking retirees and the occasional savvy foot-commuter, I realize the flaw in my wish for a purple dotted line that would point out every little inch for the non-native Leith lovers. I don’t think the Leith path OUGHT o be crawling with people–especially Tourists In A Hurry, or –god forbid–locals COMMUTING in a hurry. Back to the commute…I locate the Goldenacre path (the dirt one…completely devoid of people…almost to the Gee, I Wonder If Someone Could Get Away With Murder Here? point). Roses on either side blooming madly among the nettles. Floppy yellow climbers, brilliant pink rugosas that smell intensely but drop their petals no matter how carefully you pluck them…and small pale pink ones, five-petaled with yellow stamens, most beautiful. These last hold up well to being arranged on the handlebars… Stop a minute to pick some and decorate handlebars. I am spending a day with scarified, baggy gray & black- shorted riders with elbow pads, etc. Might as well do some “frill seeking” myself. Gosh it’s so lonely here I might be able to get away (don’t even think about being late now) with some bike-o (as opposed to auto) eroticism. I forget if this is permitted in blogs. Overhead the sky is blue with some white clouds stirred in, the trees wheel around dizzily to the pounding of jacquiehammers. (Epilogue: I only lasted one week at my ‘Riderz” gig. On Ascot opening day I fabricated a darling helmet with leaves, paper, and flowers, and brought my banjo to amuse the kids during a brake at Gracemount school. The sheer out-in-left fieldedness of this unpredictably non-uniform presentation caused poor Ian to re-think my coming north with the crew and being in extremely close quarters. Perhaps it was the best, but I was given a mere three minutes notice, and suddenly I had a free week to kill. I took a train to Inverness, just to be a real tourist for once. My bike ride was grand, but the town was a tiny bit depressing. I think I can’t really enjoy a place as much when I’m completely by myself, gawking at stuff….reader, this blog gives me the illusion of a traveling companion. ~ by jacquiephelan on June 17, 2008.